No other automaker has had more success in the last year at turning TV media buys into earned online engagement, and Kia scored again in unveiling its Soul EV on the 2014 MTV Video Music Awards. The new car was showcased with old characters – the Kia Hamsters. Since August 2013, Kia accounts for just over five percent of the $8.3 billion automakers spent on TV buys, yet the upstart brand netted for more than 12 percent of the 295 million online actions (views, likes, shares, tweets) around the same TV commercials on YouTube brand channels. Kia’s two most successful viral TV ads of the last year aired on the Super Bowl and during the FIFA World Cup; and starred Laurence Fishburne and Adriana Lima, respectively. Combined, they generated more than 5 million viral views to the brand’s YouTube channel in the days surrounding their airing. There’s no question that Kia made the right move in bringing back the Hamsters. 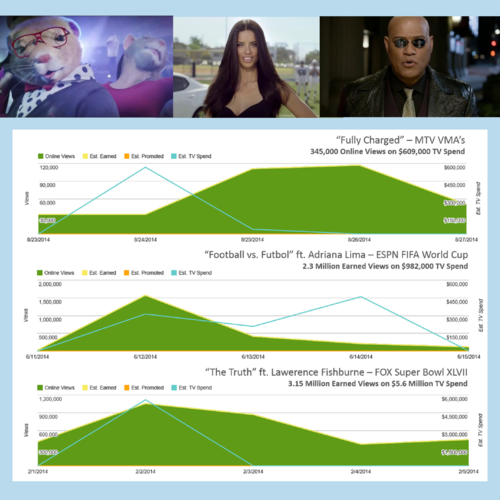 The spends were obviously much higher for the Super Bowl and World Cup spots, and the earned online views reflect that; but looking at the day before airing through the next three days after airing, the Kia Hamsters earned favorably compared to their more prominent celebrity counterparts. The new TV commercial for the Soul EV nabbed nearly 350,000 earned online views. Over their respective five day time frames, both the Super Bowl ad and the VMAs spot earned 10 online views for every $18 the brand spent on TV. They are both in the top five viral performers for Kia in the last year. The World Cup spot starring Lima, was in another stratosphere. It earned 10 online views for every $4 spent on TV! The search patterns directly after airing illustrate that celebrity was a significant driver in the World Cup spot’s success, as searches were driven by keywords surrounding Adriana Lima. “Fully Charged” follows a similar pattern to Kia’s presence on last year’s VMAs. In 2013, the brand placed a new commercial on MTV to tout the newly redesigned Soul, “Totally Transformed.” Instead of teaming the Hamsters with Maroon 5, as it did this year, Kia used a Lady Gaga soundtrack to put the swing in the Hamsters’ hips. Both ads premiered on the VMAs. Both featured new music from prominent artists. And both were viral wins. Like “Fully Charged,” 2013’s “Totally Transformed” is a top-five viral performer for Kia. Watch this fall for more of Maroon 5, Hamsters and the Soul EV. If last year’s pattern holds, Kia will spend behind “Fully Charged” through the fall premieres season on national TV, and the earned online views for “Fully Charged” will climb (along with Maroon 5 downloads). If the aim for a new product launch is to first break through the clutter and create awareness, the Kia team at David&Goliath can feel confident that it’s getting the most bang for its creative buck by pairing the Soul EV with Kia’s Hamsters.